"Poached pears served with a red wine vinaigrette." Trim flat the bottoms of pears, and stand them upright in the bottom of a large stock pot. Pour the wine and water into the pot, and turn the flame to high heat. Sprinkle with sugar, and add vanilla bean, star anise, cinnamon stick, and lemon and orange peels. Bring to a boil; reduce heat to medium low, and simmer 20 to 25 minutes. Remove pot from stove, and let cool completely. Reserve 1/4 cup poaching liquid. Transfer pears to a bowl, cover, and refrigerate. 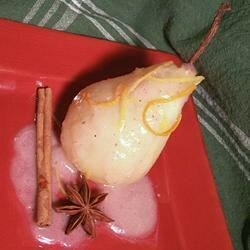 Place 2 poached pears in a blender or food processor, and puree. Remove to a large bowl. Whisk in walnut oil, red wine vinegar, and reserved poaching liquid. Season with salt and pepper to taste. Cover, and refrigerate. Place pears in individual bowls, and top with sauce.